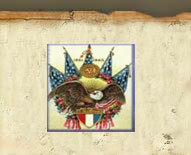 Description: Two of the medallions below the solider show American Flags. 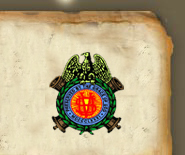 Two other medallions are engraved with the WRC emblem and read: "1905 ~ WRC". The base of the granite monument is engraved: "1861 - Our Heroes - 1865". 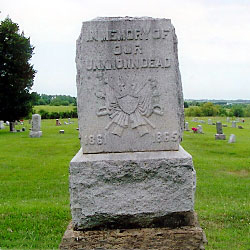 Description: The monument is engraved: "In Memory Of ~ Our ~ Unknown Dead ~ 1861 - 1865". It is surrounded by a low stone wall with modern granite corner markers with the seal and name of the major services. A modern granite bench at the edge is inscribed: "To Honor Those ~ Who Have Served" on one side and "To Honor The Spirit ~ That Our Veterans ~ Carried To Victory ~ And Sometimes Eternity" on the other side. 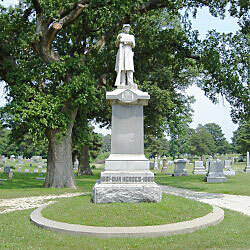 Description: The monument is engraved: "Erected By ~ Womans Relief Corps ~ Tribute ~ To Those ~ Patriots ~ Who Sleep ~ In ~ Southern Graves ~ Uncoffined ~ Unshrouded ~ And ~ Unknown ~ May 30, 1888". 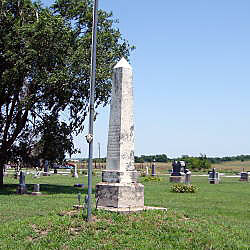 The side of the base is engraved: "Ferguson & Nettleton ~ Ottawa, KS." 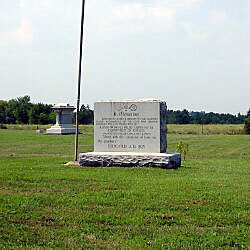 Bronze medallions are displayed on stakes in front of the supporting slab representing the Spanish American War veterans, Civil War veterans, and World War veterans. Description: The granite slab is engraved: "In Memoriam ~ Erected In Grateful Memory To The Solders ~ Sailors And Marines Of The Civil War, Spanish- ~ American War And World War By ~ Canby Woman's Relief Corps No 33 ~ Department Of Kansas ~ And The Citizens Of Osage City Kansas ~ "Sleep, With The Sunshine Of Fame On ~ Thy Slumber" ~ Dedicated A.D. 1925". 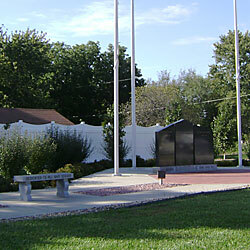 Description: A memorial plaza includes a black granite monument, flagpoles, and concrete benches. The monument is engraved: "Dedicated to the Past, Present and Future Veterans of the United States", "To our nation's veterans ~ We salute the men and women of our armed services ~ through their efforts, our nation is free, and with this ~ die now cast, may our future generation's be forever free ~ in God Speed", and "All Gave Some, Some Gave All". Also included is an identification of "World War I KIA, World War II POW, World War II MIA, World War II KIA, Korea KIA, Viet Nam KIA" each followed by names. One of the benches is engraved: "Dedicated to all who served". 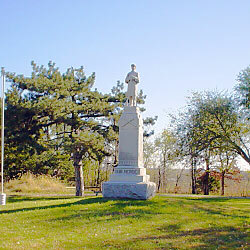 Description: Soldiers' monument eighteen feet high, including a statue of a private soldier at rest. It is five feet square at the base. The cost was $1070, raised by contributions from the citizens of Quenemo and surrounding country. It was dedicated October 15, 1908, and stands on a beautiful piece of ground donated by the Oak Hill cemetery. 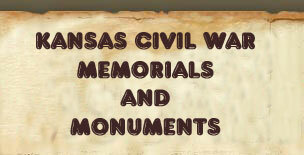 The monument is inscribed: "Erected May 1908 ~ In Memory ~ Of Our Countries ~ Defenders" and "Our Heroes". 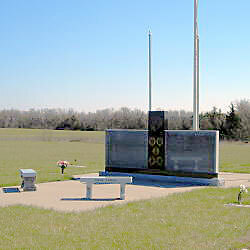 Description: : The granite slab is engraved: "In Honor Of Those Who Served Our Country". Names of those who served are engraved on the flanking slabs. The benched in front of the memorial are engraved with the four freedoms presented in President Franklin D. Roosevelt's State of the Union Speech, January 6, 1941: "Freedom From Fear", Freedom Of Speech", Freedom To Worship", Freedom From Fear".